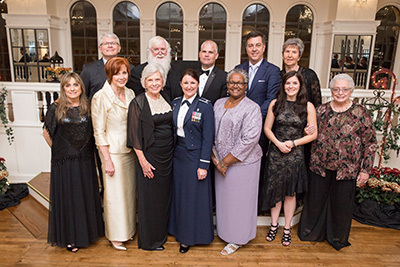 Samford University's Ida Moffett School of Nursing honored 15 distinguished alumni at its annual Courage to Care gala Nov. 3. Honorees were cited for their adherence to the maxims of the school's namesake, the late Ida Vines Moffett, and their outstanding contributions to the nursing profession. The honorees represent the many different ways nurses impact patients, families and the world around them. From positions in intensive care units, operating rooms, administration, education, and military service, each individual followed a unique path to fulfilling a calling to the profession. One Living Legacy Award and 14 Courage to Care Awards were presented at the event. The Living Legacy Award was established in 2012, in celebration of the school’s 90th anniversary. The award highlights one alumnus each year whose local touch has a global reach through leadership and service to others. The 2017 recipient is Wanda Marquardt. Marquardt’s career is as diverse as the many accomplishments she has received. She served in the Army Reserves including active duty in Desert Storm, where she cared for our nation’s heroes at Fort Benning, Georgia. She retired as a major from the Army Nurses Corps after eight years of service.For 15 years Marquardt served as chief nurse anesthetist at Carraway Methodist in Birmingham. Marquardt also served as an associate professor in the University of Alabama at Birmingham’s School of Health Related Professions and in clinical roles at Medplex in Birmingham and Andrews Institute in Gulf Breeze, Florida. She currently works part time at Birmingham Surgery Center. She is past president of the Alabama Association of Nurse Anesthetists and has participated in numerous medical mission trips. Her career embodies the spirit of Mrs. Moffett’s legacy through her commitment to excellent patient care, her leadership and dedication to serving others. The event also recognized a roster of dedicated supporters: gold sponsor John 3:16 and benefactors Mr. and Mrs. Robert D. Kicker and the Carl A. Schaefer Sr. Family. Patron sponsors included: Carolyn Chalkley, Susan Sheffield and Ann McEntire; Birmingham Baptist Hospital School of Nursing Class of 1964, Children’s of Alabama, The Cole Companies, Inc., Employment Screening Services; Issis and Sons in honor of Wanda Marquardt, Mr. and Mrs. Randall McDaniel, Sharron and Larry Schlosser and Vital Source, LLC. Music was provided by Suoni de Tre and sponsored by Jane Martin, Margaret Findlay and Gretchen McDaniel on behalf of the faculty of Ida Moffett School of Nursing. Chris Moore, a previous Living Legacy Award recipient and chair of the nursing school’s advisory board, joined Sanders in the presentation of the awards. Emily King, president of Samford University Association of Nursing Students, provided the invocation, and student musicians included Chloe Smith, Anna Taylor and Keats Rivas. The School of Nursing presents Courage to Care awards and a Living Legacy award annually. To learn more about the awards and to download a nomination packet, please visit http://samford.edu/nursing/alumni-awards/.